As an Akzo owner – mutual, pension, hedge fund or Akzo pension fund – you KNOW that a higher offer from PPG is the best you are going to get. We believe that PPG can pay as much as €100 – Akzo cannot get close to this value alone, selling chemicals and buying AXTA. Akzo management may have been “pushed” into action in defense of the overtures from PPG, but needing a “push” indicates the company does not think strategically. The sale of the chemical business should/could have been done years ago. The underperformance of the coatings business relative to peers is widely recognized – and it needs to be fixed. In this situation, shareholders should represent their investors by pushing for the best outcome – i.e. they need to be active – we are encouraged by Elliott Management’s entry. If shareholders do not support another higher PPG bid – should it come – they need to be convinced that they can do better by following the path outlined by Akzo. Corporate optimism is an increasing problem for investors today – see our recent research. There is generally no more optimistic manager than one trying to defend himself from an unwanted take-over. Whatever alternate plan Akzo puts forward should be tested against possible company specific and macro assumptions, and Akzo should provide outcome ranges. 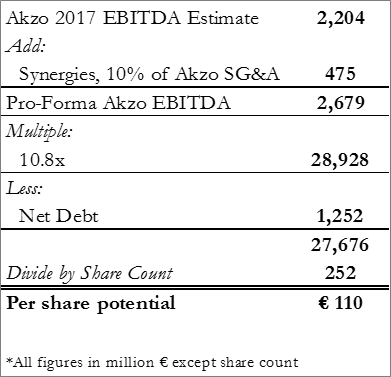 What is the real value of the chemical business – if spun out what would it trade for – if sold what are the tax liabilities – what would be the net gain – would it be accretive? How would the stock react to an expensive acquisition of Axalta (AXTA) – assuming a premium would be required to get Axalta’s attention (we do not see the company selling for less than $40 per share – and all cash). We are happy with what is unfolding; our preference for Akzo among coatings companies was predicated on underperformance financially and as a stock, with the expectation that there would be a catalyst for change – either an offer, or an activist – today we have both. If the deal gets done PPG also looks interesting based on value and track record. Whether as a result of Elliott Management’s involvement or not, we believe that a dialogue between PPG and Akzo will have to continue and will ultimately result in a deal, with PPG paying a higher price. Shareholders are unlikely to back the emerging plan by current management, based on past performance and recent behavior, when faced with a certain outcome of an acquisition which is a high price and largely cash in nature. There may be legal avenues that the Akzo management and Board can take to push PPG away, but if the shareholders – including Akzo’s pension plan – can be persuaded that this is the best deal, then the legal route is unlikely to result in a popular outcome. Akzo has been underperforming and losing share globally and a “go-it-alone” strategy will not work in a world of large scale global consolidation. Akzo’s alternative would be to acquire, for example Axalta, but it does not have the multiple to do so accretively, given what would likely have to be a hefty premium for Axalta. We believe that Akzo would need to pay almost $10 billion in cash for the company and take on over $3 billion of debt – the EV/EBITDA multiple would be 13.5x based on 2017 estimates for AXTA. Even with its recent jump in value Akzo currently has an EV/EBITBA multiple of 9.4x. PPG has plenty of borrowing capacity and plenty of free cash flow. The company currently trades at an EV/EBITDA multiple of 10.8x. At the high end of possibilities, assume that PPG pays the same multiple for Akzo, but includes synergies of 10% of Akzo SG&A – €475 million. Pro-forma EBITDA for Akzo for 2017 becomes €2.67 billion. At a 10.8x multiple, this equals €28.8 billion. Subtracting net debt and dividing by the number of shares suggest that PPG could pay as much as €110 per share for Akzo. This math is summarized in Exhibit 2 below. The negative argument here is that the chemical business is not worth that high an EBITDA multiple – OLN trades at an EV/EBITDA multiple of 8.8x expected 2017 EBITDA. An acquisition price closer to €100 per share seems more reasonable to us. The 15x potential multiples that have been suggested in some press articles forget that Akzo is not a pure play coatings company – unlike VAL. The positive argument is that the synergies are low – 10% of Akzo SG&A is less than 5% of combined SG&A and does not include raw material purchasing synergies or revenue synergies. 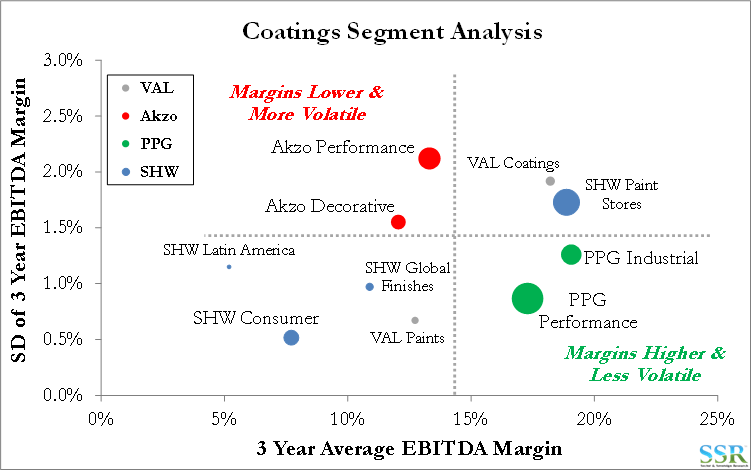 While SG&A is part of the answer (so we need to be careful not to double count) there is significant EBITDA in bringing Akzo’s coatings businesses to PPG’s margins. Exhibit 3 shows the comparative chart that we have used before and Exhibit 4 shows the gains from improving the margins – this would not be an immediate gain for PPG, but is more than supportive of our conservative synergy target. This deal could be very good for PPG, assuming that the company pays a fair price. However, the market may be reluctant to give PPG the benefit of the doubt, especially as the acquisition price rises – and we believe that it will. 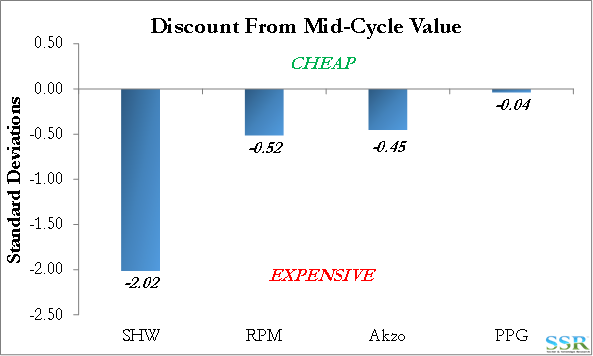 Today PPG does not look expensive – particularly relative to other coatings companies – Exhibit 1. Equally important, PPG has a very strong track record of value creation from acquisition integration and well timed business exits. The company has steadily improved its return on capital – Exhibit 5 – and has reduced the volatility in returns through the moves it has made over the last ten years. A successful bid for Akzo will likely cause a step down in returns initially, but it would be wrong to bet against a company with a track record as solid as PPGs. We would buy PPG on any further weakness that this current saga creates. A Possible Akzo Strategy – Sell Chemicals, Buy AXTA – Not Worth as Much! Akzo has stated that it would rather go it alone – sell or spin specialty chemicals and possibly buy more coatings. In Exhibit 6 we look at a sale of specialty chemicals and a purchase of Axalta at $40 per share. We are assuming the tax basis in chemicals is equal to the asset base and if Akzo could sell at 8.8x EBITDA (OLN’s current multiple) the company would net around $7.5bn. 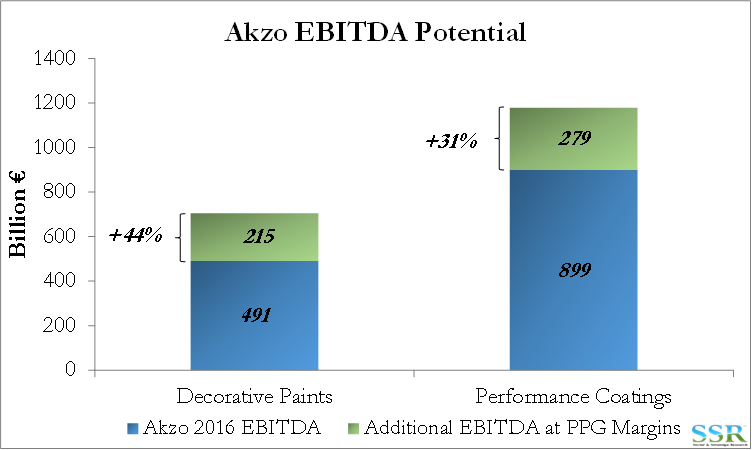 The net effect is a likely value for Akzo that does not match what PPG has already offered. 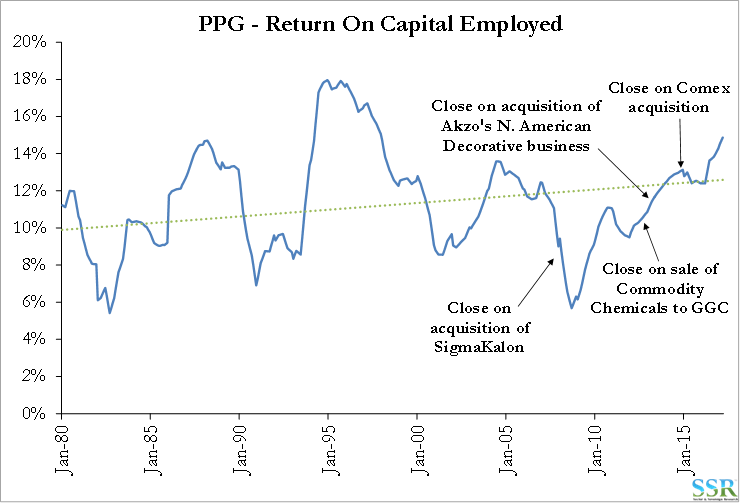 It does not reflect upside from where the stock is now, unless you assume further multiple expansion. Akzo may be able to get a better result by spinning the chemicals business and borrowing to buy Axalta but the debt burden on Akzo would be high, even if Akzo put most of its liabilities on the chemical company.